I really liked this; it’s like a radio show sitcom. So if old radio shows aren't your thing than this might not be for you. It is like a radio show in that it's like you are watching a comedy on television and have turned the picture off and are just listening to the talking. Drama is funny and it really comes across in her story lines. 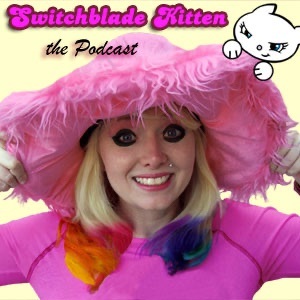 It is quirky and original and if you aren't a fan of the switchblade kittens it would still be interesting and it introduces you to a bit of their music. You have to see this podcast on its own terms as a show and for entertainment, and on that front it rocks. HORRIBLE!!!! This is one of the worst things I have ever seen in my intire life! It's hilarious, if you are a Switchblade Kittens fan, or if you just have the silly sense of humor that it takes to find Drama's sense of humor funny. Truly hilarious! Personally, I think this is horrific!! No wonder there are no ppl who have written reviews!! Unless, this is for children, it is HORRIBLE!! !